The first time I ever laid eyes on my kitchen I fell in love with it. When we first moved in we had no intentions on changing anything in the kitchen. 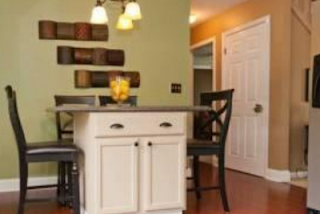 I had this theory that the decor I had in my previous home would just flow perfectly in our new kitchen. I was even able to bargain with the previous owners for their kitchen chairs. The kitchen was a grassy green color, with a cherry Pergo floor, the counter was black with tan and brown spots in it and the cabinets has some sort of tan textured paint on them. Once my decor was placed in the kitchen I realized real fast that the grassy green color on the wall was not going to work. Even my husband told me that the green had to go. So with those words said, I started planning. With luck on my side, we received a $25 gift certificate in the mail, to be used at any paint store that sold Benjamin Moore paint. I had never actually been to a real paint store before. I don't consider a home improvement store to be an actual paint store. When I walked in I felt completely out of place. For one I was one out of two women in the store, the rest was professional painters and workers. But I had one thing on my mind, I wanted my kitchen to be painted gray. I decided to go with the Benjamin Moore Stormy Sky #166 eggshell paint. This was a dark gray. It looked like it did not have any blue or green undertone to it in the store. But when I got it home and on my walls it had a slight blue undertone to it. I was very impressed with the quality of this paint. No wonder it was so expensive. I have placed the before and after pictures below. The before picture is what the kitchen looked like when the previous owners still occupied the home. I was able to find this picture from when the realtor had placed it out on the web when the house was for sale. I think the gray made a big transformation. When I started painting the room, I was kinda scared when I saw how dark the gray was. But when it was finished I just stood back and said WOW. When I placed all my decor back up the wall the color bought out the gray outlines in the frames. Can I say again this again I LOVE THIS COLOR! I love the color! Absolutely gorgeous!